The .com registry sends security business to Neustar. Verisign (NASDAQ:VRSN) has sold its Security Services business to rival registry provider Neustar for up to $120 million. The deal is for $50 million up front and a contingent amount of up to $70 million due on the first anniversary. The contingent payment is based mostly on successfully transitioning customers to Neustar over the 12-month period after closing. Verisign’s Security Services business includes DDoS protection, managed DNS, DNS Firewall and recursive DNS services. 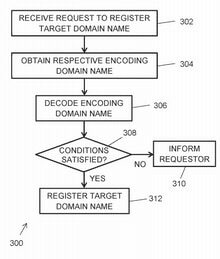 Verisign (NASDAQ: VRSN) has filed two patents related to buying future rights to domain names for if they become available. The process is rather unique and it makes me wonder what Verisign (which manages the .com registry) has up its sleeve. Only one of the patent applications has been published so far. Application number 15/488984 for “Domain Name Registration Reservation Through the Use of Encoding Domain Names” was filed on April 17, 2017 and published today (pdf). The application notes that an application for “Domain Name Registration Reservation Through the Use of Encoding Domain Names for Pools” was filed at the same time, but it has not been published. Court of Appeals agrees that covenant not to sue is valid. The United States Court of Appeals for the Ninth District has ruled against top level domain name company Donuts over the .Web domain name. Donuts was one of the applicants for the .web domain name. Nu Dot Co won the auction for $135 million after Verisign (NASDAQ: VRSN) struck a deal with it to transfer the ICANN agreement for .web to it after the auction. Donuts was upset that Nu Dot Co wouldn’t participate in a private auction for the domain name. Instead, Nu Dot Co pushed it to an ICANN “auction of last resort”. Had the auction been private, Donuts would have received about a $22.5 million payoff for losing. Donuts went through ICANN’s normal appeals channels. When that failed, it sued ICANN in District court. The judge tossed out the suit because the application for new TLDs included a clause that the applicants would not sue ICANN. Donuts argued that this agreement not to sue is invalid. The Appeals Court agreed with the lower court that the covenant not to sue was valid (pdf) in a decision published yesterday. .Web still doesn’t have a green light, however. Afilias was the runner-up in the .Web auction and it is fighting the auction result through ICANN’s appeal processes. While Donuts was upset about missing out on a payday by losing the auction, Afilias was upset that it didn’t win. Regardless of the outcome, both may benefit and get some satisfaction out of the delay they are causing Verisign. After all, Verisign did all it could to delay the launch of new top level domain names. It will be interesting to see if Donuts’ strategy around .web changes when Akram Atallah takes over as CEO. Either way, Donuts’ fight against .web might be over. It will probably just hand the baton off to Afilias. .Org operator is changing how it works with registrars. Public Interest Registry (PIR), the group that operates the .org top level domain name, recently announced changes to how it’s approaching marketing through the domain name registrar channel. On today’s show, PIR interim President and CEO Jay Daley discusses why the organization is making these changes. Jay discusses the current state of registry marketing and sales through registrars, how we got here, and what might change in the future. It’s a great interview. Also: AWS.com, DomainTools injunction, Sedo gets into expired domains, and Verisign’s (NASDAQ:VRSN) .com contract.